Everyone has a different survival plan, so a "one size fits all" approach to equipment obviously won't work. That, of course, is why there is such a variety of cook stoves, lanterns and heaters available. Because of this problem, I have chosen to concentrate on equipment which will meet the needs of the two most divergent ideologies - mobile survival mode or fixed location survival. Let us assume someone from Southern California is gathering survival equipment. What hazards to they face? The San Andreas "Big One" earthquake is an obvious reason to be prepared, as if it fractured there would be no water, electricity, natural gas or food available. In addition, the vast population of the area would become like a cloud of locusts, devouring everything available almost immediately. [This could apply to many scenarios = war, terrorism, etc.] The smart move would be to evacuate the area at the first opportunity, and that means having portable survival equipment already packed and ready to go. This subject is covered very well, complete with lists and "how to" information, in my booklet "Evacuation and Relocation." 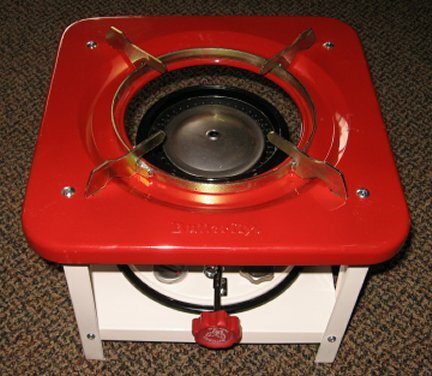 The Butterfly #2412 pressure stove is made to disassemble and can be safe for travel. 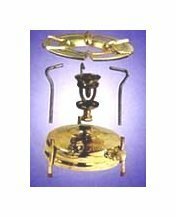 Being of all brass construction and with the pressure pump being the only moving part, these stove can be depended upon to last virtually forever. There is a cap on the end of the plunger which can be used to seal the fuel tank - after the burner is removed. The #2412 is a small pressure stove with a #1 burner, but puts out at least 6,000 BTU, which is more than enough for cooking. It also will burn about any fuel that pours, although thicker fuel may require 2 or more preheatings with alcohol before it will burn. For indoors use, only kerosene should be used, as burning kerosene produces almost no carbon monoxide. You will need to make up your own kit bag for travel use of the Butterfly #2412. 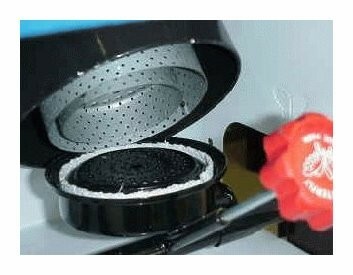 The burner can be removed, but it is sooty and therefore should be kept in a plastic baggy. The upright supports should be stored in a separate bag so they do not get lost, as should the jet picks. The legs should have rubber feet installed to prevent scratching of table surfaces: the tips for door stops can be glued on the bottom of the legs. 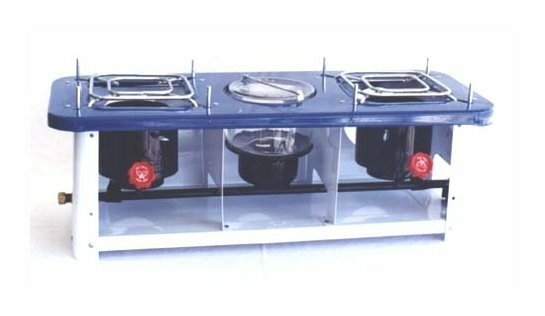 There are two basic design concepts for kerosene cooking stoves available today, the gravity flow system and the multiple-wick models. Here is a set-up on my porch. #2418 on left, two stoves under cook stands, a bottling tank on left and waterbatch canner right. 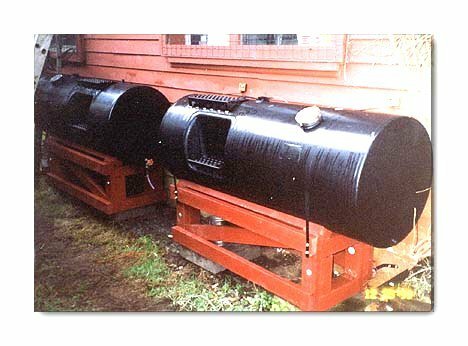 Gravity flow, edge-burning wick stoves date back to the 1920's when they were made in the millions by Boss, Perfection, Florence and many others. Millions of housewives used these stoves for their everyday cooking needs until Rural Electrification was completed in the 1950's. The basic design was shamelessly copied by Butterfly because it was proven to work for decades. These stoves use a wick which fits on edge into a slot. The red knob (above) is opened and fuel flows from the glass reservoir through the tubing, through the valve controlled by the red knob, and into the slot with the wick. The directions for use are the same for all of the stoves. The advantage of these stoves are there are no moving parts except for the fuel flow valve. The 7/8" wide wicks are made from fiberglass woven around a copper mesh, so the wicks last for a long time in daily use. Every time the stove is turned off the wick burns clean, so maintenance is not frequently required. Thus the stoves can be used to cook meals every day with a minimum of effort and fuss. The maximum output of 7,000 BTU/hr per burner is sufficient for most cooking and baking requirements, but marginal for heavy duty use such as canning. Which model to choose for your own individual requirements depends upon how much you plan to cook, how much space you have available, etc. I gave my mother a single burner #2413 during Y2K, for example, because she was familiar with these stoves, having used on during The Depression. I have a #2418 and have used it frequently. 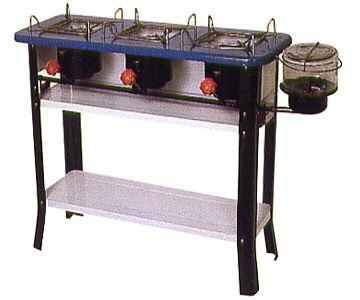 I gave a double-burner #2416 to my church for use during power outages because it has legs and could be brought out for use as required. 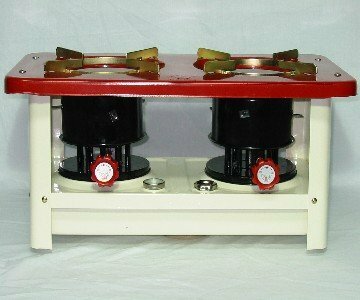 The double-and triple-burner models are best-sellers to homemakers in Asia, being used as their only cook stove. Be absolutely sure to order order extra wicks. St. Paul Mercantile has them in stock, and I do also, but they are less expensive when ordered with the stove. The #2641 is a no-frills 10-wick stove, but it's inexpensive and it will boil water for coffee and cook dinner when the power goes out. A strong, 2-burner, 10 wick stove. 7,000 BTU/hr per burner. These are versatile stoves and could be used for everyday use. The photo above illustrates the size of the #2648 stove top, and the grate will hold the #2421 oven securely. This 16-wick stove produces 10,500 BTU/hr maximum. The cook top holds the oven securely and is wide enough to hold a waterbath canner with ease. The open sides provide easy lighting of the wicks. This may be the most versatile multi-wick stove. Maximum heat of 14,000 BTU/hr. Large and strong enough to hold a large kettle, with enough heat output to quickly boil a lot of water. For heavy duty, frequent use canning or baking, this is the stove. The steel grill is very stout and the round design of the body is inherently strong. 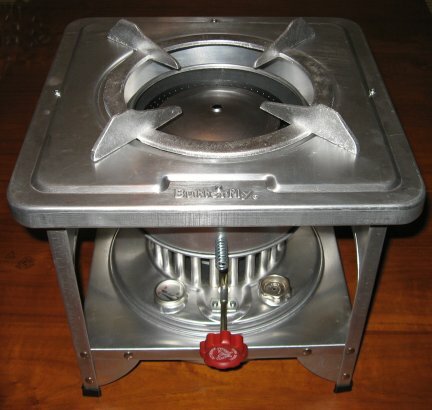 An all-aluminum stove that should last for decades. Same output as the #2698, but lighter and easier to carry. This stove is used in restaurants in Asia. If you only use a large stove once a year for canning, this is the one to have because it will not rust in storage. Easy to light. Multi-wick stoves use cotton strands as wicks. The number of wicks determines the heat output. The wicks are pulled through the wick tubes and the red knob visible above on each heater raises a plate so all wicks raise and lower simultaneously. The wicks are inexpensive and in an emergency you can liberate cotton strands from a mop head to re-wick a stove. The stoves are all metal, only one moving part, and if cared for will last decades. Each of the various multi-wick stoves above fits a specific purpose. 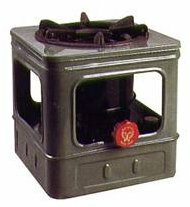 I prefer the #2487 and A-822 for ease of lighting because of their open sides, but the #2698 has a definite purpose as a heavy duty stove. The two-burner #2648 is amazingly versatile at an inexpensive price. For everyday use it is just fine: 7,000 BTU output is more than sufficient for normal cooking requirements. Those who simply want to have a stove stored for power outages will find the 10-wick #2641 extremely handy during emergencies. Older Butterfly stoves from Y2K sometimes surface in new condition, the box never even opened. Some of those older stoves were very inexpensive when made and sold and need a little more care to set them up properly. 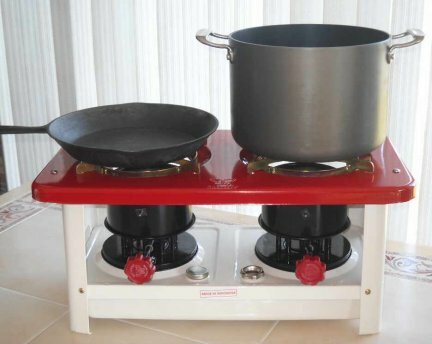 The cooking stand can also be of great help for supporting an oven or even a canner. Kerosene cookers can be used as an emergency heat source. 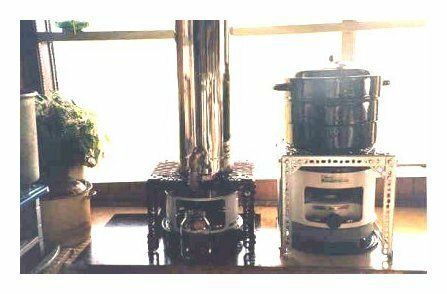 I have used the Alpaca, Butterfly, Premier Sr. and Swastik stoves as heaters in my greenhouse on extremely cold winter days. And yes, I have used them in the house for heating as well. The burner unit on a cooker lacks a flame plate on top, as do kerosene heaters: the flame is designed to impact a solid surface directly at the cooking surface. 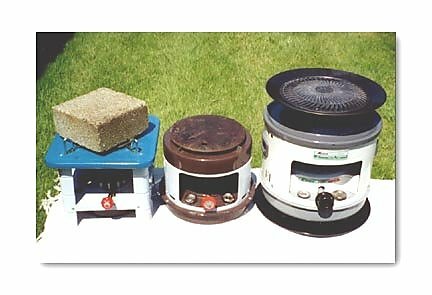 I use an 8" x 8" x 3 5/8" concrete block (or a round steel plate) on top of the units when using them for heating. The flame is adjusted to a bright blue, with no yellow showing, and the concrete block acts as a heat sink, moderating and dissipating the heat. Don't laugh -- it works. The Alpaca needs to be burned at nearly maximum heat output, however, or the fiberglass wick will foul with tar balls and burn poorly. In fact, I've had them literally go out when used for extended periods of time as heaters because of tar ball buildup on the wicks. Then the tar balls need to be crunched with a pair of smooth, paddle bladed pliers just so the wick can retract! I don't like the Alpaca.... With a multi-wick stove like the Butterfly, you can simply snip off the top of the wicks, pull them up a little, and have a fresh surface to burn. You don't do that with an expensive Alpaca wick! Butterfly #2457 on left with a concrete block. Butterfly #2628 in center holding a 1/4" steel plate. Alpaca on right heating a diffuser plate. The stove top strength of all but the #2487 and #2698, in my opinion, are not large or strong enough to safely support the width and weight of a loaded water bath canner. Yes, it could be done, but it is much better to build a cook stand...the stove fits underneath the stand, and the stand itself supports all the weight of a very wide, heavy canner. 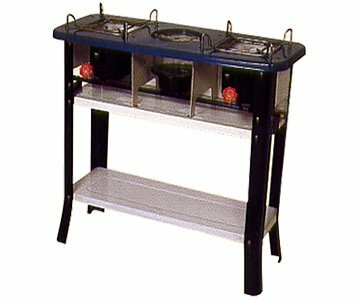 If you do not have the scrap metal on hand to build a cooking stand (below), it is actually less expensive to buy a #2687 and have not only a spare stove, but a hotter stove. Canning with only one single-burner stove is NOT desirable! For example, how do you simmer the lids? 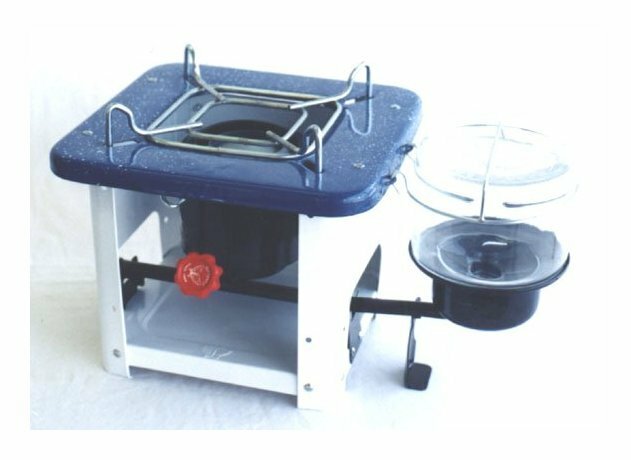 A small, everyday meal cooking stove combined with a larger, hotter canning stove makes canning safe and efficient. 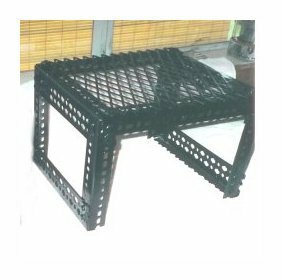 A cooking stand may be made using inexpensive pre-drilled 1 1/2" angle iron or the legs and top bracing, and a piece of "expanded" steel bolted to the top. Note details of the construction of the cooking stand. The legs (12" average) and top brace (at least 12 x 12") are 1 " steel strap, bolted together with 3/8" bolts (3/4" long) with nuts and lock washer on the inside. The top is steel "expanded metal," cut to fit and bolted to the top using 3/8" bolts (1" long) with fender washers to secure the expanded metal to the top. The actual measurements of the top size do not matter so long as it is at least a foot square. If you find a scrap of expanded steel at a lumber yard that is 12" x 15," you can use it to make a 13" x 16" stand simply by cutting 1 " pre-drilled strapping with 2 pieces 13" long and 2 pieces 16" long, plus 4 legs at 12" each.. The top brackets are cut one inch longer and wider than the piece of expanded steel so that sharp edges of the expanded metal are recessed from the edge of the top bracket when bolted down. Pieces of pre-drilled 1 " flat strapping are first held against the top corners at close to a 45 degree angle, holes aligned, then marked with a pencil. Cut with a hack saw, deburr with a file, then bolt on the corner braces on the inside of the legs and top. Look closely at the illustration above and you will see the braces. The end result is a stand that will support literally hundreds of pounds very safely. A wide water bath canner, for example, will easily fit and not be the least bit "tippy," and all the weight is off the stove! "Ron made me a cook stand for my kerosene cookers. He made it out of a stout 4 ft. long aquarium stand that we had in the shed. He also had a piece of galvanized steel that are used as walkway grates. He welded that under the top of the aquarium stand. The aquarium stand is an 18" tall "lowboy" and it is just perfect for this use. The stand was black and he added steel sides and back and painted it red. It looks real nice." 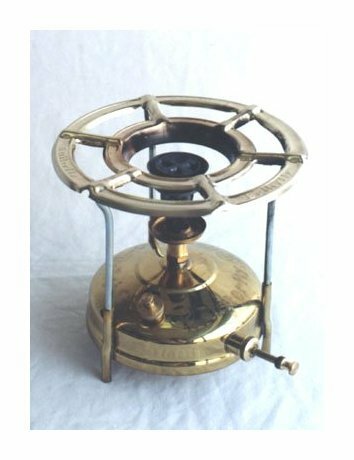 When reading the above descriptions of the stoves and lanterns, you will note that I have made reference to the "multi-fuel" capabilities of the Butterfly #2412, the "Golden Night," etc. "Multi-fuel" means kerosene, diesel, #1 stove oil, and other assorted fuel oils, including alcohol, and in extreme emergencies, gasoline. Gasoline is a highly volatile fuel, however, so I DO NOT recommend its use. Due to the inherent burning qualities of the fuels themselves, only kerosene should be used when the stoves or lantern are used indoors, as the other fuels produce excessive quantities of carbon monoxide. If used outdoors, or even in garage with the door open, ANY place with adequate ventilation, the other fuels may be burned without danger. You may encounter the phrase "dual fuel" in conjunction with some Coleman stoves and lanterns. That refers to unleaded gasoline and white gas, also called "Coleman Fuel." Gasoline in all its forms produces explosive vapors and can explode. Kerosene (and other fuels) used in "multi-fuel" stoves is NOT explosive, does NOT produce explosive fumes, and IS stable in storage.